The New Bern Battlefield Park is located at 300 Battlefield Trail, 5 miles outside of the city, at the entrance to Taberna. The New Bern Historical Society received the core 24.65 acres of the battlefield from the Civil War Preservation Trust, and additional acreage adjacent to that site was later acquired. Today the Battlefield Park includes over 30 acres of the original battlefield. With the help of a grant from the Craven County Tourism Development Authority, this site was awarded recognition by the National Register of Historic Places. 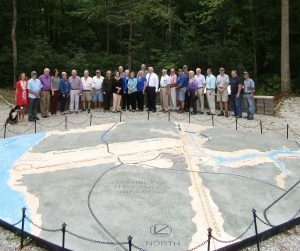 On March 10, 2007 an 11.5-ton granite and bronze monument, donated by the 26th North Carolina Regiment Reactivated, was dedicated on the battlefield site to the memory of the men of the 26th North Carolina Regiment who fought and died during the battle. “Investment in History” fundraising campaign raised sufficient funding to install a History Walk and Gateway Plaza with a focus on interpretive signage, completed in October 2015. The Gateway Plaza leads to a unique 20 foot diameter color ground map and signage that provides an overview of the battle and a starting point for tours. Around the Visitors Center and along the battlefield trails are arrayed 36 interpretive panels that recount the Battle of New Bern and the impact of the Civil War. The ground where nearly one third of the Battle of New Bern occurred is in near pristine condition. Unmarked by development or agriculture, the “redans” or fighting positions remain, as they were a century and a half ago. You can literally walk in the footsteps of young Confederate and Union soldiers who were here on that fateful day: March 14, 1862. The Battlefield Park serves an important role in preserving New Bern’s rich heritage and completes the North Carolina Civil War Trail system from Bentonville through Goldsboro and Kinston ending in Fort Macon and Fort Fisher. US Highway 70 East. Turn on Taberna Way. (from Havelock, turn left; from New Bern, turn right.) Go over railroad tracks. Turn left on Battlefield Trail, which leads you directly into the Battlefield. The battlefield is open to the public during daylight hours, throughout the year. Guided tours of the battlefield, given by a trained volunteer battlefield guide, can be arranged by advance reservation by contacting the New Bern Historical Society at 252-638-8558 (at least 3 days in advance, please). Guided tours are $5 per person for Historical Society members and $10 per person for non-members. Guided tours can also be arranged and tailored especially for military units and school groups. The tour is best suited for 5th graders and above or after they have studied the Civil War. Prices for student groups are generally $2 per student and $4 per adult. Please contact the office at 252-638-8558 for more information. The newly-installed battle map and interpretive panels, along with our self-guided tour brochure, provide a comprehensive overview of the battlefield. Visitors are welcome during daylight hours to take the self-guided tour. Click here to view our battlefield brochure and map. Click here for a self-guided tour brochure. Go to the bookstore to purchase. Also, check out the Harry Goodman Battlefield Adventure Day, a children’s event held each Spring!